Haryana is well known around the country for its richness in the field of farming. It’s rich not only in terms of agricultural land and farmers but also in terms of livestock with a population of 10 million. And more interesting than this thing is the fact that 6.7 million animals from this population are milch animals. Yep – Haryana is very rich when it comes to dairy as it has got availability of 660 gms of milk per capita, which is second best in the country and much higher than national average milk availability of 232 gms per capita. It’s clearly an asset that they can’t afford to lose. The government is already well aware of these facts. As a result, it keeps formulating various schemes to maintain its power in the field of dairy farming. The latest initiative in that direction is introduction of a new insurance scheme for milch animals and their owners, and in this article we’re going to learn more about it. Under this scheme the owners of milch animals will be allowed to insure their animals for a sum of Rs. 20,000 INR – Rs. 50,000 INR depending on lactation yields of the animal. The annual premium required for the insurance will be Rs. 100 INR only, or less than that, depending on the animal. If insured animal dies due to any unfortunate incident, its owner will be provided the insurance amount in form of compensation. The scheme won’t replace government’s already implemented Livestock Insurance Scheme (LIS) and will be implemented as a separate scheme instead. The aim of government with this new scheme is to provide some financial security to those farmers and milch animal owners who can’t afford to insure their animals under LIS or any other such scheme. The registration of animal with Veterinary Surgeon is mandatory of District if someone wants to avail the benefit of this insurance. Without registration no benefits will be provided. 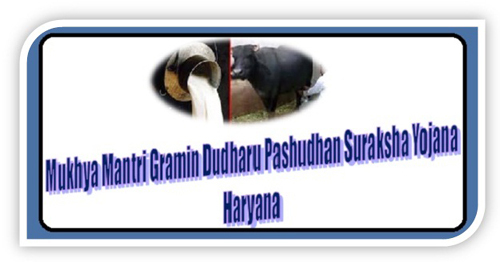 The highest authority for execution and implementation of this scheme is Haryana Livestock Department Board (HLDB). It will receive the registration fee submitted by the owners of animals and will utilize those funds to finance the execution of scheme. It will also keep full record of all animals insured under the scheme. In order to avail this scheme the owner will have to get his/her milch animal registered with Veterinary Surgeon in Govt. and pay the annual registration fee of Rs. 100 per year (Rs. 25 in case of goats). The surgeon will register the animal, tag the animal and take a photograph of animal along with a photograph of owner. The insurance coverage will continue to work as intended even if an animal is sold to someone else, as long as the new owner notifies the Veterinary Surgeon about his purchase. If animal dies within 15 days of registration. This last requirement has been kept in place to prevent registration of ailing animals under the scheme. In short, the insurance amount won’t be paid if insured animal dies due to owner’s negligence or any crime intentionally committed by him. Additional Deputy Commissioner (ADC) of District or his representative of IAS cadre. If someone’s milch animal registered under the scheme dies and he’s eligible to receive the claim according to terms and conditions outlined above, he/she will have to inform the Sarpanch of his Gram Panchayat and submit a written application to the Veterinary Surgeon of his area. After receiving the application surgeon will arrange a post mortem of dead animal and a post mortem report will be generated. Post mortem report provided by the surgeon. Once these things are submitted by the applicant, the committee will verify all the details. If information provided by the owner is found true the claim amount will be credited directly to his/her bank account within a month of form submission. By the end of Fiscal Year if any money is saved from these funds of Rs. 20 crore, it’ll be re-invested in the scheme for financing next year’s expenses. If an application isn’t approved or rejected within a month of its submission, or if payment of insurance amount takes a long time, the applicant can complain about it to ADC of District, Deputy Director of DADF or Nodal Officer of scheme in HLDB. As you can see, this is arguably one of the best financial security schemes ever released by the government for poor farmers and milch animal owners. If you own an uninsured milch animal you should definitely take its advantage to add a layer of financial security to your life.